I’ve posted regarding the superstreet intersections being constructed in Ohio and have wondered just how many more accidents are happening? According to the research, not having to turn left (and making a planned U-Turn instead) “reduce” accidents by 63%. Hmm … perhaps once we adjust to them, I’ll fell like they are an improvement, but currently approaching one on a dark, rainy and glary night can be confusing. If you sit down and think about it, the notion of making a left turn across oncoming traffic at a stoplight is pretty absurd. All that stands between you and certain oblivion is the hope that other drivers headed your direction are obeying the speed limit and paying enough attention to notice when the light turns red. Traffic engineers have known for years that hanging a left increases the likelihood of an accident and wastes fuel. The minds at UPS have even gone so far as to design their delivery routes with fewer left turns, and transportation departments all over the country have adopted so-called “superstreets” that force drivers to make a right and then a U-turn in order to go left or straight. Sound absurd? Think again. 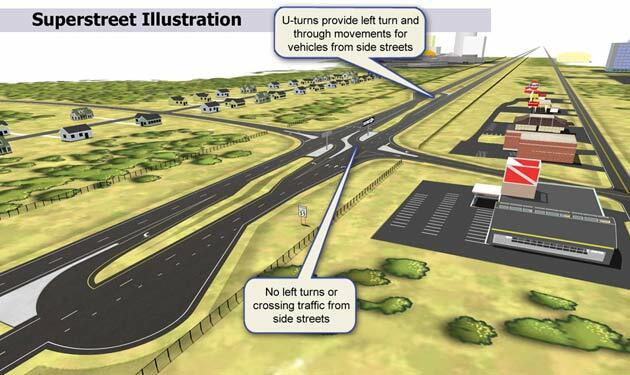 According to Smithsonian Magazine, researchers at North Carolina State University have found that the superstreet design is more efficient and safer than allowing drivers to turn across traffic. After examining data from 13 superstreet intersections and comparing them to their traditional counterparts, researchers found that, on average, the superstreets delivered a 20-percent decrease in travel time and caused 46 percent fewer reported traffic collisions. More importantly, the superstreet design caused 63-percent fewer accidents that resulted in personal injury. There’s some food for thought the next time you’re hanging a left.